Each collaborator manages their own notification preferences from the Activity Log tab within the Workspace. 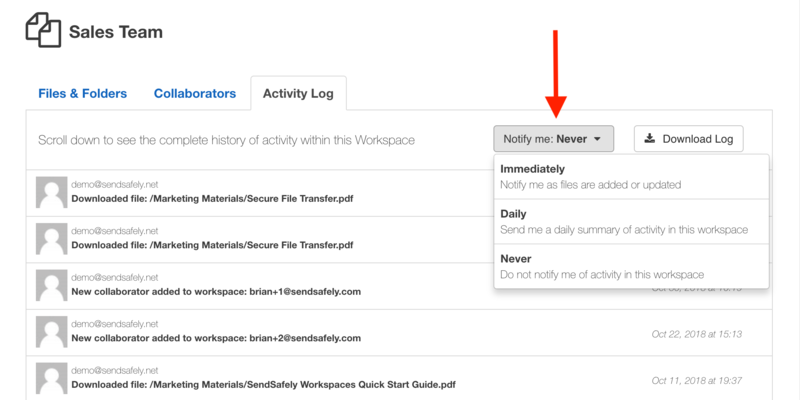 Immediately - Email notifications will be sent when files are added or updated in the Workspace by any collaborator. Choose this option if you have an urgent need to know when new files are available. For very active workspaces you will be notified every 15 minutes. Daily - A single daily email is sent summarizing all file adds or updates occurring that day. If no updates occur, no email is sent. Choose this option if you anticipate a large amount of activity within your Workspace and do not wish to receive multiple notifications. Never - No notification emails are sent (this is the default option).